Discover lets you organize visualizations onto dashboards, combining tables and charts in useful and interesting layouts. This tutorial teaches you how to use the Discover user interface to create a new dashboard and populate it with visualizations. 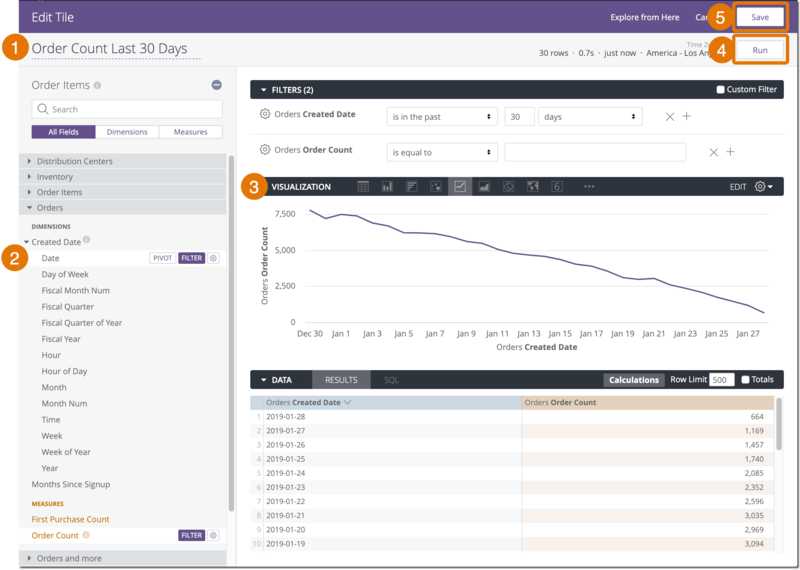 A dashboard is essentially a collection of visualizations of queries, displayed all on one page. You can add filters to make the dashboard interactive and rearrange its tiles. After you’ve configured a dashboard to your liking, you can share it with your team. You can create as many dashboards as you like and can tailor each dashboard to the specific needs of the users. You can explore or use a Look to get the query for a query-based tile. Either way, the query of the query tile belongs to the dashboard. Even if you use an existing Look to create a query tile, the Look is only used during the creation of the query tile. The tile is unaffected by any later changes to that Look. The query tile will still exist independently on the dashboard even if the Look is deleted. When possible, use a query tile to avoid cluttering up your Spaces with unnecessary Looks. The query for a Look-linked tile is linked to a Look. That Look is used when creating the tile and every time the dashboard is refreshed. A Look-linked tile is a good choice if you want to create, change, and test a query in one place but use it in multiple dashboards. The Look and the dashboard must be in the same Space. If the Look is changed, the changes to the Look will show in your dashboard. If the Look is deleted, the dashboard will show an error for this tile. A text tile does not have a query. You can use text tiles to add headers and text to your dashboards. Often text tiles are used to make visual sections on a dashboard or add descriptions as needed. You can specify one or more of these choices: a title, subtitle, or body text. The body text can use a subset of the Markdown markup language. See the Using Markdown in Text Tiles documentation page for more information about which Markdown syntax is supported in the text tile body. You can also use the Markdown toolbar, located at the top of the Body box. Create a blank dashboard, then add tiles (query tiles, Look-linked tiles, or text tiles). Start from a saved Look, then add its query to a new dashboard as either a query tile or as a Look-linked tile. Start from a query on the Explore page, then add its query as a query tile on a new dashboard. 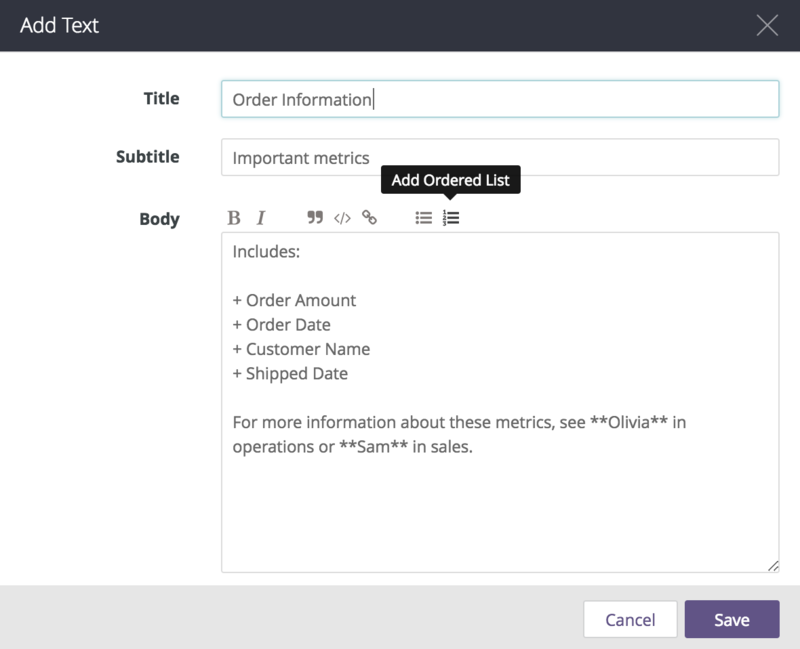 Think about the number and complexity of elements that you add to a dashboard. More elements require more browser resources, which increases dashboard rendering time. 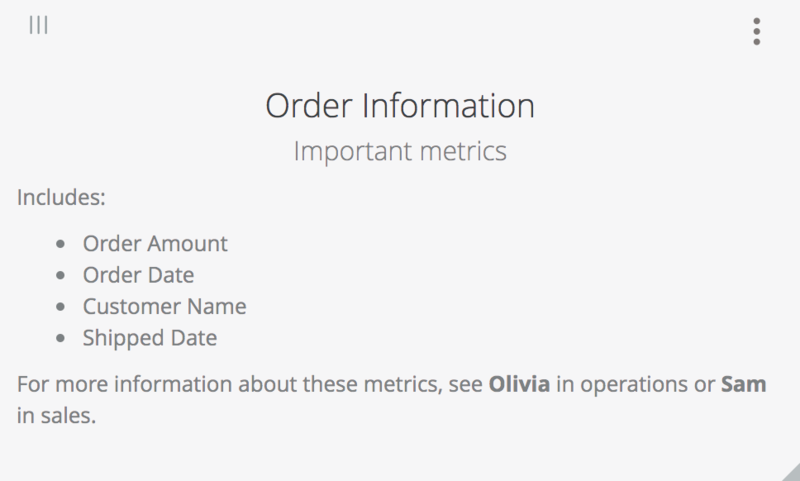 If rendering becomes an issue, consider creating multiple dashboards with fewer elements. Select the Space in which you want to create your new dashboard. In your new dashboard, click New Tile to add a new query tile. (Alternatively, you can click Add Looks to add a saved Look, or click Add Text to add headers and text). Select the fields and filters for your query. Once you have set up your query, click Run. Click Save to save the query as a tile on your dashboard. In the upper right, click the gear menu. To add a query tile, click Save to Dashboard to add a query tile using the same query as your Look. This is often the best choice. This option means that your dashboard will not be dependent on the Look. Changes to the Look will not affect the tile in your dashboard. If the Look is deleted, your query tile will still exist on your dashboard. To add a Look-linked tile, click Add Look to Dashboard. This is a good choice if you want to create, change, and test a query in one place but use it in multiple dashboards. This option is not available if the Look and the dashboard are in different Spaces. If the Look is changed, the changes will show in your dashboard. If the original Look is deleted, the dashboard tile based on that Look will display an error. Give your new tile a title. 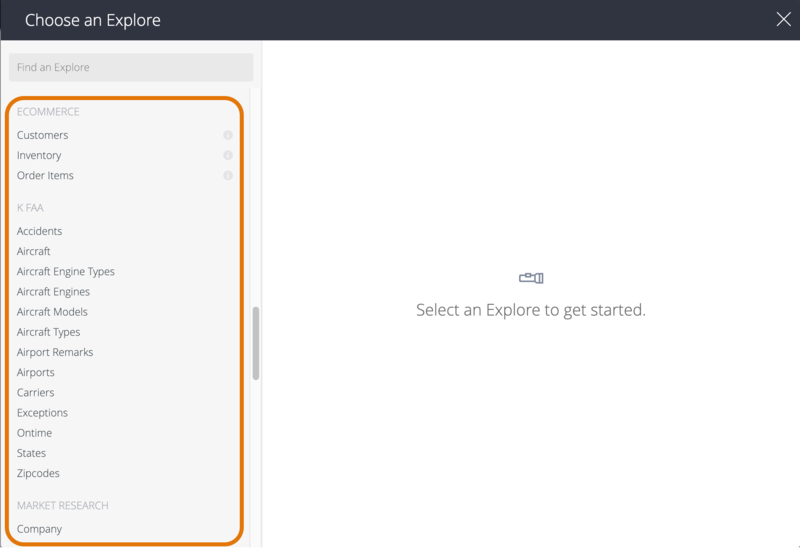 Then just follow the same steps as with adding any Explore query to your dashboard. A query tile is based on an independent query, one that is not linked to a Look. You can add a query tile to a blank dashboard (described above) or edit an existing dashboard to add additional query tiles to the dashboard. Copying the query from an existing Look. In a query tile, your dashboard will not be dependent on the Look. Any future changes to the Look will not affect the tile in your dashboard. If the Look is deleted, your query tile will still exist on your dashboard. Discover adds your new tile to the bottom of the dashboard and automatically sizes the tile, but you can move and resize the tile however you like. You can also edit the tile after you’ve created it to adjust the name of the tile, the visualization, or the underlying query. You can add Look-linked tiles to a dashboard only when the Look and the dashboard are both saved in the same Space. If you would like to add Looks from a different Space, first copy the Look into the same Space as the dashboard. You can add Look-linked tiles to a dashboard while editing the dashboard. In order to add a new Look, click Add to the right of the Look’s name. If you’d like to remove a Look that already exists inside the dashboard, click Remove. Click Update Dashboard to save any changes you made from this window. Discover adds your new tile to the bottom of the dashboard and automatically sizes the tile, but you can move and resize the tile however you like. This will bring up a window where you can add a title, subtitle, and body. All of these elements are optional, providing some freedom about what type of text is used. Some HTML, including links and images, is supported in the titles and subtitles. In addition, a subset of the Markdown markup language is supported in the body text. See the Using Markdown in Text Tiles documentation page for more information about which Markdown syntax is supported in the text tile body. You can also use the Markdown toolbar, located at the top of the Body box. Hover over each icon in the Markdown toolbar to see what format it creates. Once you save, you will see your header/text tile appear at the bottom of the dashboard. It can then be moved and re-sized like any other tile to suit your needs.